Rocket balloons are a fantastic toy for outdoor play (or in large indoor spaces). Pump them up and let these balloons rocket to the sky! 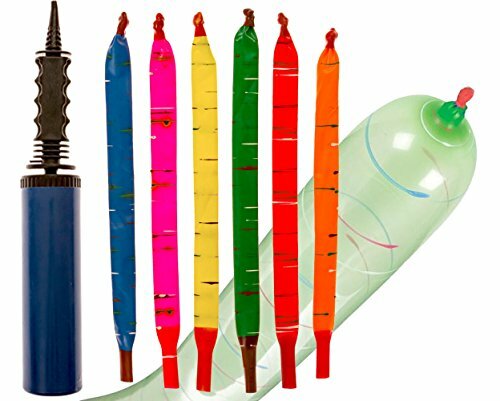 Made from premium-quality latex with an aerodynamic latex tip, our rocket balloons can be inflated to 40" in length and can be re-used multiple times - it'll be a long time before you need a rocket balloon refill. 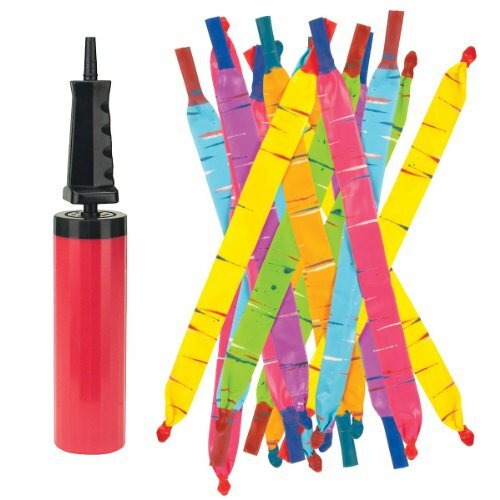 Our giant rocket balloon set party pack contains 100 balloon rockets in a variety of bright colors plus a two-way balloon pump, making for quick and easy filling - balloons and pump sold together. Our set of rocket balloons with pump is perfect for parties (a great alternative to standard party balloons), picnics, beach days, school activities, science experiments and more. 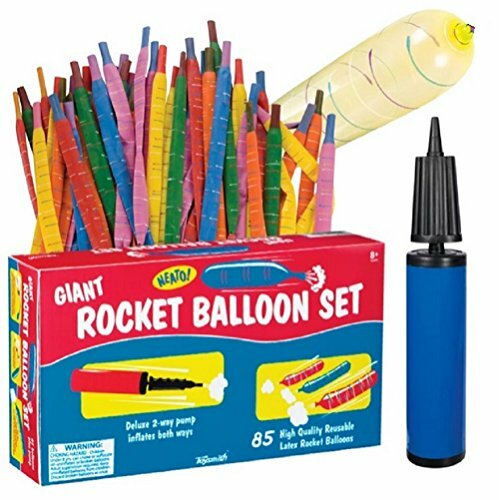 Giant rocket balloons sets also make a great gift! Recommended for children ages 8 years and up. Pump color may vary. Blast off into the skies with Toysmith Rocket Balloons. These rocket balloons can be inflated up to 40-inches in length, Let them go and watch them zoom skyward. 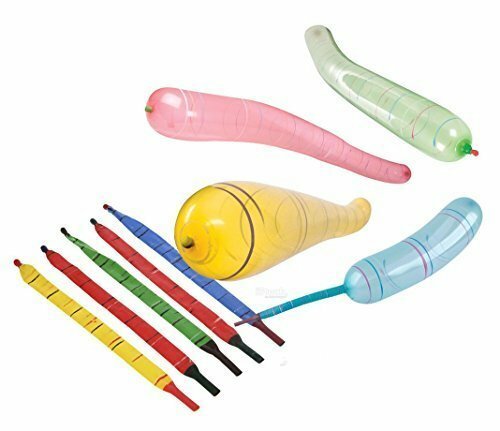 The rocket balloon pack contains forty (40) latex balloons in various colors, plus air pump. Rocket balloons can be re-used after every flight for hours of entertainment. Suitable for outdoor entertainment, these rocket balloons are great entertainment for parties and other events. Recommended for ages 8 years and up. Blast off into the skies with the Toysmith Giant Rocket Balloon Set. These rocket balloons can be inflated up to 40-inches in length, Let them go and watch them zoom skyward. 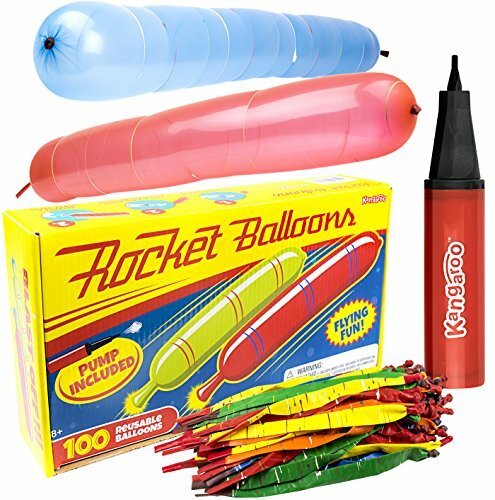 The rocket balloon pack contains eighty-five (85) latex balloons in various colors, plus air pump. Rocket balloons can be re-used after every flight for hours of entertainment. Suitable for outdoor entertainment, these rocket balloons are great entertainment for parties and other events. Recommended for ages 8 years and up. 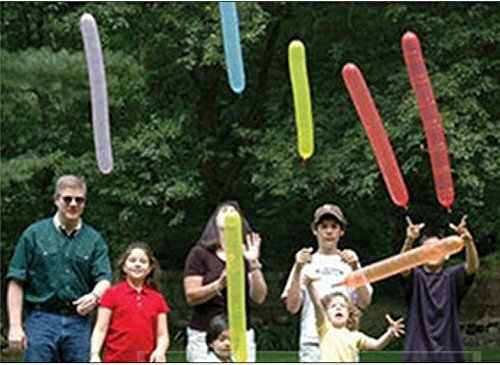 Send balloons soaring with the Toysmith 20 Rocket Balloons with Pump Set. Your children will enjoy hours of fun sending balloons zooming through the air with loud, silly noises. Just attach a multicolored balloon, push and pull the pump, and let a balloon fly. The balloon soars to the sky with a silly shriek, drawing kids in for a turn at the pump. 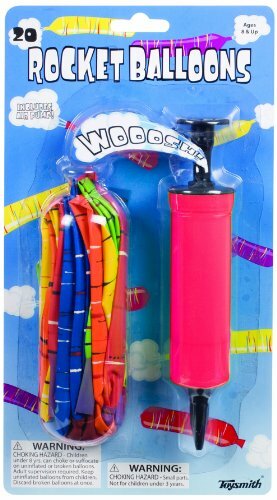 Attaching and inflating the multicolored balloons is made easy thanks to the included kid-friendly hand pump. Help your kids build hand and arm strength and hand-eye coordination with this simple yet brilliant balloon rocket set. Give kids the gift of science with toys that foster curiosity and encourage scientific learning. Recommended for ages 8 and up. 72 After inflating balloons, let them go and watch them zoom! Inflating balloons to their 40 inch length is easy with the. Great for outdoor play and parties. Assorted colors, may vary. This toy is SO fun!!!! All you do is pump up the balloon and let them go. The way the balloons are made, they fly really far into the air, spin around and make a really funny noise when they fly! 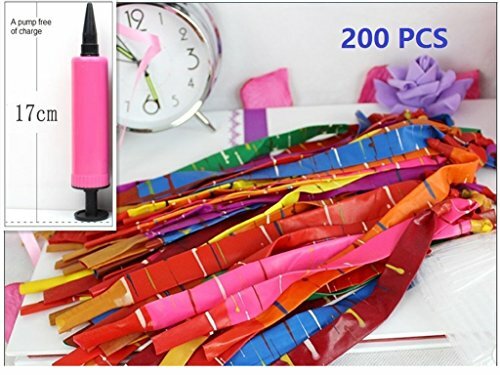 The first thing, however, to make sure of with these it to only give your child 1 or 2 balloons at a time and have them chase them or else you will have littered the entire park in ten minutes. Also, if they have to chase the balloons in order to reuse them, they are getting a ton of exercise without even realizing it. 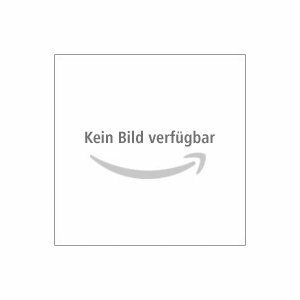 Compare prices on Rocket Balloons at TopShopion.com – use promo codes and coupons for best offers and deals. We work hard to get you amazing deals and collect all avail hot offers online and represent it in one place for the customers. Now our visitors can leverage benefits of big brands and heavy discounts available for that day and for famous brands.